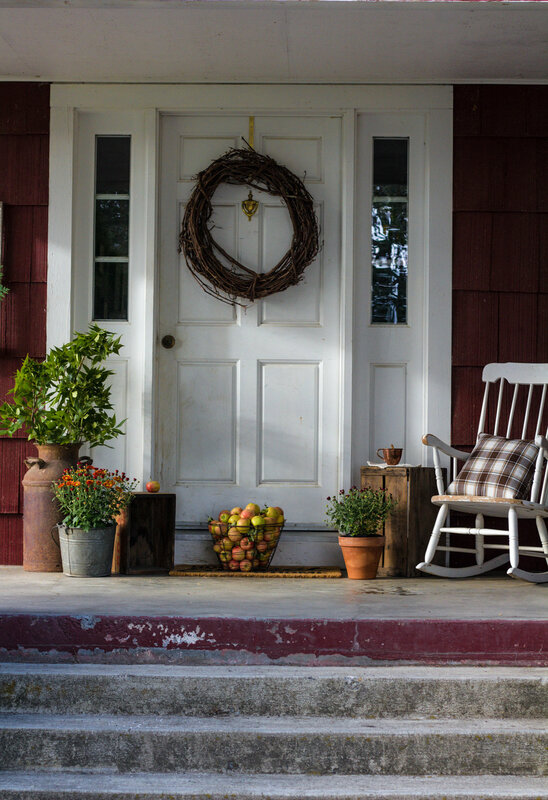 Sharing early fall decorating ideas for your fall front porch. Today I finished the last touches on my fall porch decor. I call this my early fall front porch decor because come October it will be all pumpkins. Our pumpkins are ready to harvest, but I wanted to give my apples some limelight. After all we do live in apple country! Almost everything you see on the porch, I had lying around. The rocking chair was a garage sale find from last summer. The apple basket was actually a barn find. I finally got enough courage to go upstairs and snoop around our barn loft. Yes, I have been at the ranch for ten years and just never had the courage to go up to the loft. There was lots of dust, old wood and a barn owl keeping a close watch on me. I purchased the fall mums from a local store, two mums for $6.00. I thought that was quite the deal! The pillow is a pillow cover from Amazon which I only spent $14 for two cover. I cut some greenery from one of our many trees around the house and added it to my milk can. The apples were picked from our orchard, which will soon be made into apple butter, and of course a pie! I hope you enjoyed my simple fall decorating ideas. You really don’t need to spend money on your front porch. Get creative and use items you already have. As always have an amazing weekend! I know I will be sipping hot apple cider on my porch.